Ok, it's time to come clean. I feel terrible to have to tell everyone, but I'm going to be cutting my posting to twice a week. It's been coming on for a while, and I know that a few of you have noticed. I have a few things (actually, a lot of things) going on in my life right now that makes it very hard to create, post, and visit others. I'm going to try to visit, but it's very difficult. I'm so sorry!!!! I wish I had more hours in the day to visit all of my wonderful friends!!!!! I hope you understand!!! This is something I am going to create with my little ones for Easter. For those that know a little about me, you'll know that I love to create with my little ones. :) Using the Animal Kingdom cartridge and the marker attachment I made 2 bunny outlines. You could easily do these on a computer, this was just a little quicker this way. My little ones are going to color the bunnies (which is always a blast for them to do and for me to watch). :) After they are colored they will cut them out (using childproof scissors). If you're anything like me you have a bunch of these puff balls around. Now if you're like me, one of the fun parts of an Easter basket is the candy! What would a hop be without candy, too? Well, I have a little bit **sorry, I didn't take a picture**. All you need to do is leave a comment on this post. You don't have to be a follower, or anything; just comment. A random winner will be picked on Wednesday, April 20th. 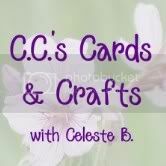 You're next stop is Carolee's Scrappin' Spot, and you'll love what she's created!!!!!! Carolee's Scrappin' Spot <--------- You're next step!!!!! Wahoo!!! It's another Flaunt it Fridays!!! These are so much fun!!!!!! This week at Flaunt it Fridays the challenge is to use the fish from Simply Charmed. Well, like most times, this is not a cart I own. So this week I decided to use Animal Kingdom. fish - cut from Animal Kingdom at 1. We'd love to see what you create this week with us!!!! Make sure you stop by Flaunt it Fridays to see what the rest of the DT has created and to play along with us!!!! This week over at Scrapbookaholic by Abby the challenge that we have going on is to create something with an animal and using the color orange. The reason for that is because this month the ASPCA celebrates the 'Prevention of Cruelty to Animals Month'. So in honor of that I decided to make this cute little frame. I know most people would have put a cut-out of a dog or cat, but I chose a deer. We love taking pictures of them, so I thought it would be fun! I just put the phrase in there for now. I have too many pictures that it's hard to decide what to put in it. :) Thanks so much for stopping by!!! Make sure you stop by Scrapbookaholic by Abby to play with us!!!!!!! I'm so happy to be a part of the Flaunt it Fridays DT! I just love a fun challenge!! :) This week on FIF the challenge is to use the sheep on the Country Life cart. Well, this is another cart on my wish list; so I had to use a different cartridge. I decided to make this cute diaper card. The yellow part comes out for you to write on (my camera died so I didn't get a chance to take a picture of it out). Ribbon - a WONDERFUL gift!!!!! I wanted to stick with a simple card. Recently, I noticed that I kept wanting my cards to get bigger and better and more detailed; but realized that it doesn't need to be. :) Sometimes it's the cute and simple that are fun. :) So even though it's simple, I still hope you enjoy it. Make sure you stop by Flaunt It Fridays to see what the rest of the DT has planned. You'll LOVE the creations, they are really amazing!!! We'd love to have you Flaunt your stuff with us!! !